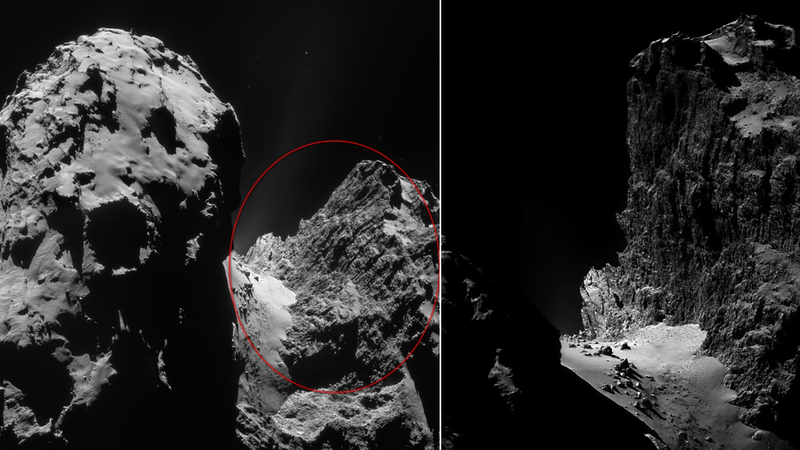 While sifting through images taken by the Rosetta spacecraft of Comet 67P, an amateur British astronomer has uncovered a previously unknown vertical cliff that looks like something right out of Mordor. The original image was captured by Rosetta's NavCam at a distance of 20.1 km from the center of the comet on December 10. Looking at the foot of the cliff, you can see some relatively smooth terrain dotted by boulders, some of them as large as 20 meters (65 feet) across. It may look daunting, but owing to the extreme low gravity on the comet, a human could actually survive the jump. I am so, so happy about that, seriously. Not just because personally it is nice to have an image which took a long time to make being seen and shared so widely now, but mainly because it shows why the ESA decision to regularly release navcam images from the ROSETTA mission was the right one to take – it has allowed people like me to use ROSETTA images for Outreach, and to promote the mission to the media and the public. Every reTweet and every FB share and comment proves how much interest in the mission there is out here. People are blown away by that image and the view of the cliffs it shows, so thank you AGAIN to ESA for letting us see the navcam images and allowing us to use and play with them!